Nepean Blue Mountains Local Health District (NBMLHD), in collaboration with The University of Sydney and Western Renal Services, developed a mobile app that allows patients to send their home haemodialysis (HHD) data to nursing staff remotely and in real time. To improve uptake of HHD in the Western Renal Service, by making patients feel connected and empowering them to manage their dialysis treatments at home. To improve clinical decision making by monitoring patients’ treatment parameters and detecting complications and changes in mood early. To improve efficiencies by reducing home visits by staff and clinic visits by patients. Provides a new and effective model of care using digital technologies. 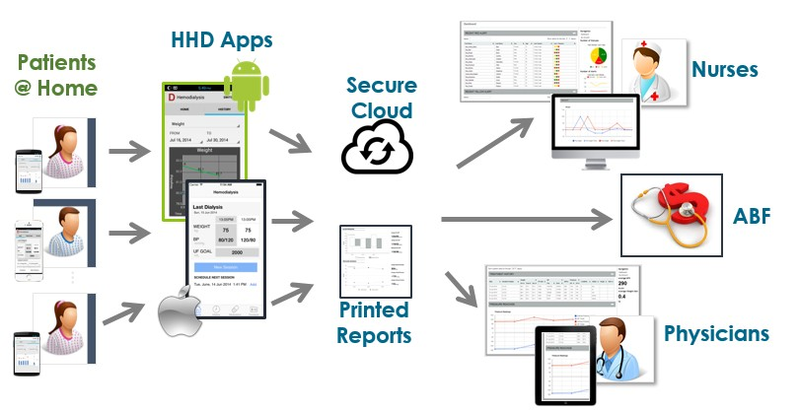 Enables remote monitoring of HHD data, including mood and early detection of complications. Empowers patients and improves their sense of safety. Increases engagement between patients and nurses. Provides high-quality information to improve clinical decision making. Improves efficiencies by reducing home visits by staff and clinic visits by patients. Potentially reduces hospitalisations and unplanned readmissions. Increases patient satisfaction through better interactions with healthcare staff. Improves timely access to care and supports patients at home and in the community. Haemodialysis is a treatment for patients with end stage chronic kidney disease to sustain their lives. It can be performed at a dialysis unit or in a patient’s home, known as HHD. HHD offers flexibility around the timing and duration of dialysis, while also reducing the time and costs associated with travelling to a dialysis centre. This is also cheaper for the community and is associated with better patient outcomes. In Australia, around one in 10 patients who have dialysis treatments are on HHD1. However, there are a number of barriers in the uptake of HHD, including fear of being alone and dialysing independently, and a feeling of being abandoned2. Other challenges include nursing support for patients living in rural and remote areas, making clinical decisions for patients based on large amounts of data that is handwritten by the patient, and situations where patients forget to bring their HHD logbooks to consultations with clinicians. While telehealth models have been used to deliver video consultations to patients on haemodialysis in remote settings3, there have been no attempts to record and monitor HHD data from a patient’s home to a dialysis unit in real time. Remote patient monitoring, in lieu of home or clinic visits, can make patients feel connected to their healthcare professionals and empower them to manage their chronic illness. It can also offer significant convenience and cost savings to patients in terms of travelling, waiting time and transport costs4, 5, 6. The Home Haemodialysis Remote Monitoring System (HHD-RMS) is the first telehealth system in the world that is specifically designed to monitor a patient’s HHD data remotely in real time. It includes a My Home Haemo App that is available on Android and Apple devices, allowing patients to send dialysis data on a secure web server through their home WiFi or mobile network. 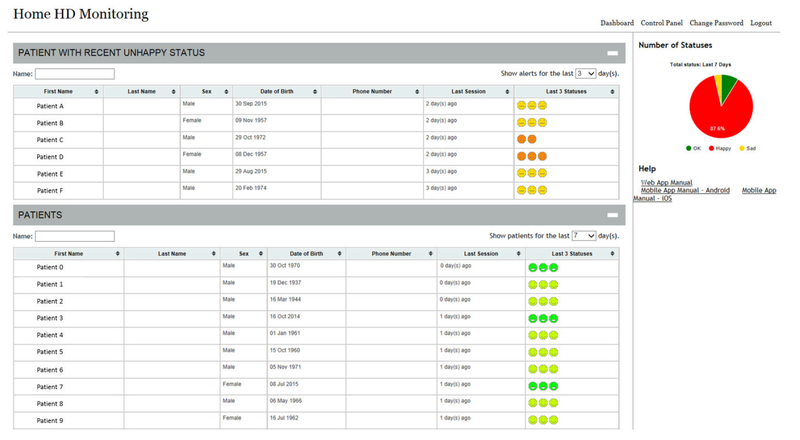 The data is available immediately via an online dashboard in the home haemodialysis unit, accessible by nursing staff. 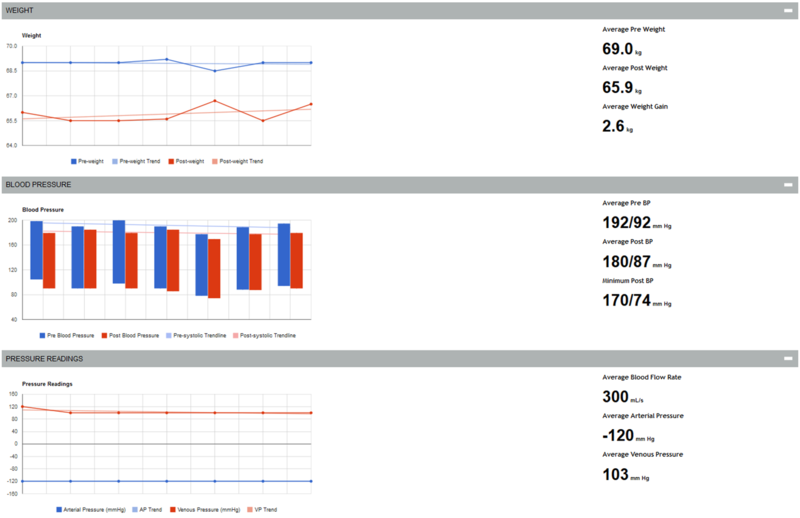 allows nurses to focus on patients who aren’t feeling well or have significant changes to their HHD data, through an alert screen on their computer. There is little need for ongoing support once the app has been downloaded and functionality of the remote monitoring system is established. As HHD data is available to healthcare professionals in real time, treatment parameters can be adjusted to improve health outcomes, and patients feel more confident in managing their haemodialysis at home. September 2012: Initial brainstorming to justify the use of information technology for HHD patients. June 2013 – January 2014: Study plan submitted. Content and design planning started with IT, medical and nursing staff. Development of a user agreement covering consent, confidentiality and the purpose of the app. April 2014: Initial proposal provided to the NBMLHD Telehealth Steering Committee. May 2014: A two-week trial to test the app’s functionality on Android devices, with 10 patients participating. Improvements were made based on feedback received from patients and nurses. November 2014: Apple Operating System (IOS) version launched. January 2015: Patient recruitment intensified, with 74 of the 125 prevalent patients participating in the pilot project. January 2015: Pilot project started. June 2015: Pilot project completed. February 2016: Agreement signed for trial in South Western Sydney Local Health District (SWSLHD). April 2016: Staff and patients in SWSLHD started using the My Home Haemo app. May 2017: Agreement signed with NSW Agency for Clinical Innovation (ACI) and Vulsen Technologies to upgrade the Home Haemodialysis Remote Monitoring System and roll it out across NSW. In the initial trial held from January 2015 to June 2015, 74 patients from the Western Renal Service used the My Home Haemo App and received notifications, emails or phone calls based on remote data received in real time. Occasions of patient reviews increased by 270 per cent during the trial, with 11 hours and 544 kilometres in travel time and distance saved by patients. A total of 14 hours was saved by nursing staff and patients by replacing home or clinic visits with online consultations4,5. In a patient survey conducted in May 2014, patients expressed improved confidence, connectedness and involvement in their HHD care. The Home Haemodialysis Remote Monitoring System technology was refined following the initial trial and a second trial was undertaken at Liverpool Hospital in April 2016. The updated version allowed facilities to manage unit-specific data, so patient confidentiality was protected. The second trial proved the system can be implemented across multiple sites with ease. There have been expressions of interest from other health services in Australia and around the world. Work has begun to scale the project across NSW, in collaboration with the ACI and Vulsen Technologies. Journal publications and presentations at national conferences are ongoing. Clear goals, an open approach and respect for the professional expertise of each team member was integral to the success of this project. The project is easily scalable and would require minor changes to the app to expand its use to more facilities, including a secure web-based platform that can store large volumes of patient data. The project is a low-cost solution that does not require significant capital investment, as it uses existing patient devices and hospital computers. Working closely with the clinical staff and patients during the development phase, including clear feedback to ensure the system was simple and practical, were essential to its success. Walker RC, Hanson CS, Palmer SC et al. Patient and caregiver perspectives on home hemodialysis: a systematic review. American Journal of Kidney Disease 2015;65(3):451-463. Chow J, Donaldson P, Fortnum D et al. Beyond dialysis — telehealth initiatives. Renal Society of Australasia Journal 2016;12(1):18-25. Sud K, Nicdao M, Kim J, Arisy A et al. Remote monitoring of home haemodialysis patients using a newly developed smart phone app. Nephrology 2015;20(3):57. Nicdao M, Kim J, Baldacchino T et al. My home hemodialysis app – a new telehealth tool for remote monitoring of patients on home hemodialysis. Renal Society of Australasia Journal 2016;12(2):41-47. CSIRO. Home monitoring of chronic disease could save up to $3 billion a year. Canberra: CSIRO; 2016.